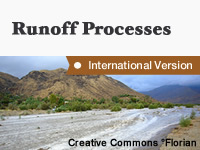 The Runoff Processes module offers a thorough introduction to the runoff processes critical for flood and water supply prediction. This module explains key terminology and concepts including the following: types of runoff, paths through which water becomes runoff, basin and soil properties that influence runoff, and numerical runoff modeling. Examples of popular runoff models are also discussed. Good lesson which covers quite a broad amount of information. Kudos, helpful, concise, nice multimedia. Recommend it often. Retake it now and again. Thank you. Good lesson and give me a new experience. nice lesson in introduction of runoff process. This topic well presented and easily to understand. It also amazing and fun answering the quiz given. Great for going through a variety of concepts quickly. The content is relevant to my work. Modelling part was bit difficult to understand. need more examples to understand better. very informative and aptly configured for the topic. A very good Modelling Concept and hydrologic process are shown very nicely through a flowchart. Overall the structure of the lesson was very good. Hi Greetings to all ! First of all i want to thank all the technocrat who put their heart and soul to design this module.Hats off.Knowledge packed module.very much relevant to my career,and the module is user friendly. while learining i am very patient enough,while attending the quiz i am undergoing anxiety and marking the answer..... :-). Well designed, easy to comprehend course content to begin with. lessons make the study more interesting.. Excellent presentation of various sub modules. An informative and useful primary lesson in hydrology. Explained in a lucid and coherent manner. Very interesting way of learning. The graphical explanations enhanced the better understanding of field or practical conditions. very interesting method of learning with the help of computer world. Perhaps, based on the concept of Seeing & believing although seeing here is virtual. let us utilize & empower us more and more. The summary given at the end is also essencially important & helps a lot to revisit the topics covered. It helps when one can not complete the module in one go. Gives a clear picture of Run-off process in a lucid manner. The lesson was very informative and useful,but modelling concepts require added descriptions for me to understand the subject. Enhances and transfers knowledge in respect to our job profiles. THIS IS ALL EDUCATIONAL AS WELL AS ON THE JOB TRAINING FOR ME. Well-crafted module. Developed to an ascending subtopics. It will fill the interest of a learner. Thanks for the Module. The module is quite informative. Thanks for this module. It clear all ideas of Basic hydrology. It is very useful.High quality Gif picture in the module.Thanks a lot for providing such a good module. Thanks for the module; it helps a lot to keep our minds fresh about this matter. Love the graphics.